This week our birders got a nice surprise at Fort Jefferson. Three Young Herring Gulls were spiraling above one of the fishing boats and remained in a somewhat photographic position long enough for our birdwatchers to take advantage. The photos were absolutely stunning! The Herring Gull is a fairly large gull that is sometimes confused with almost any of the large gull species. The young reach maturity at four years old. Their coloring is predominant of the quintessential gray-and-white, pink-legged seagull, and considered as the most familiar-looking gull of the North Atlantic found across most of coastal North America in winter. Because of this familiarity on the East Coast, most folks just call them seagulls. The Young Herring Gull wears a variety of plumages in the first four years of life making identification a little tricky. 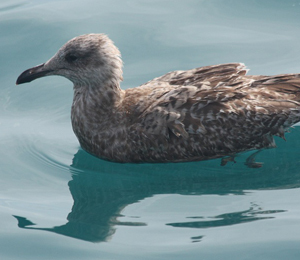 It might help to learn the identification process through the Young Herring Gull's beefy size and shape. Even as adults, this presents almost endless opportunities for identification. These guys prefer drinking fresh water, but, they will occasionally drink sea water out of necessity. An interesting fact is that they have special glands situated over their eyes allowing them to expel the salt which would possibly dehydrate another animal, as well as a human. The salty excretion can be seen off the ends of their bills and dripping out of their nostrils. As a couple, the Herring Gulls pick their nesting site together usually in the sand, soft soil, or short vegetation of their territory. To hide the nest from predators or prevailing winds, it is generally placed next to a bush, log, or rock. After hatching, both parents split foraging responsibilities for up to about 12 weeks in order to supply each chick up to half a pound of food each day as it nears fledging. Their brood usually consists of at least three chicks. These pairs are very good at producing all three hatchlings into flying machines. This usually means that at least one of the newly flying chicks, and sometimes two, will lose its parents within days after taking its first flight. The courtship rituals between these couples include mate-feeding and bonding for life. While the Herring Gulls do not need to be swimmers, they do enjoy all sorts of waters, especially on a hot summer day. They enjoy patrolling the shore lines in scattered groups searching, soaring, and spiraling down picking up scraps off the surface. These guys can only catch the slower prey, like small crabs. It is never a sure thing that the crab remains in their captivity, since the Herring Gull lacks strength in its jaw and will usually lose its food at some altitude trying to get it opened. They are, however, competitive, raucous, threatening, and usually steal from other birds while rallying around the fishing boats. Our Young Herring Gulls have given our birders a most interesting watch during this week. Hopefully, they'll return as adults to give us more insight to their behavior and habits.